About three years ago, I began working as a dive guide in Malapascua Island and met Gary. Being active with multi-sectoral organizations in Cebu during my university days, I helped Gary get organized to turn our common dream into reality. We conceptualized Project Sharklink, a collaborative project that aims to define characteristics of cleaning stations for sharks and rays (mixed and exclusive elasmobranch) that frequent Monad Shoal, as well as develop a feasibility study of proposed social support programs for the local community on Malapascua Island. Also behind Project Sharlink are Save Philippines Seas (SPS), Steven Lim and Timothy Tan of Ngee Ann Polytechnic University in Singapore and Dr. Simon Oliver is our chief scientist. The Malapascuan community is faced with many challenges. Despite being in a prime tourism spot, abject poverty is commonplace and life expectancy is low. Fisheries are continuously in decline adding more woes to fisherfolk who are entirely dependent on the sea. It is no wonder that many fishermen are forced to catch and sell shark meat for a pricely sum just to provide food for their families. We decided to involve the local community - to educate and empower by playing an active role in eco-tourism and shark conservation. In 2014, we organized Migo sa Iho (Visayan for Friend of Sharks) a group of local fishermen tasked to protect Monad Shoal and its surrounding waters. They were so effective that last year, they were deputized by the Bureau of Fisheries and Aquatic Resources and the Local Government Unit of Daanbantayan. Migo sa Iho’s sheer determination to protect the environment have led to significant arrests of illegal fishers who enter Monad Shoal and confiscations of shark meat at the local market. Last year, the Philippines mounted its first ever Shark Summit, with Greenpeace Southeast Asia as one of the key organizers. 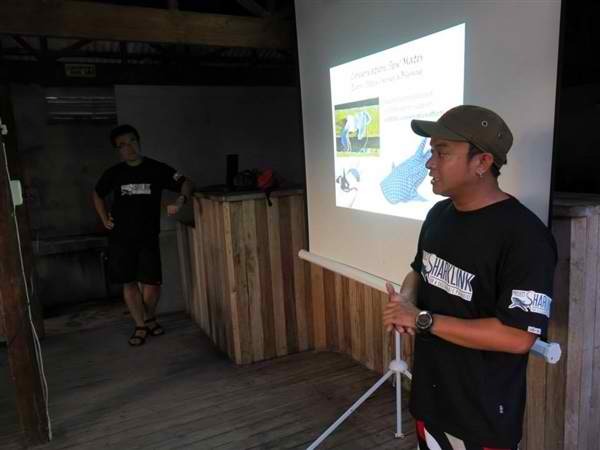 It brought together marine scientists, environmentalists, fisherfolk, coast guard officials, hoteliers, divers, even shark aficionados to meet and discuss with government officials on concrete ways to save sharks and rays. It was ‘jawsome’, prompting a Cebu official, Thadeo Ouano, to pass a provincial ordinance (No. 2014-15) to amend a previous one that mandates the protection of sharks and rays. Ouano’s new ordinance now has more bite and seeks to penalize the catching, possession, and trading of all shark and ray species, including the processing and exporting all kinds of shark in Cebu. This year’s Shark Summit also produced great results- a landmark ordinance (Executive Order 16-2015) designating Monad Shoal and Gato Island as the site of the Philippines’ first shark and ray sanctuary! Clearly, sharks and rays in Cebu have much to celebrate down below. It is also a huge victory for the Malapascuan community and for the many groups who have labored intensely to champion our shared ecology. It is our hope that other neighboring provinces follow suit, where civic organizations and communities work hand-in-hand with other stakeholders for the sustainability, protection and conservation of the marine environment. This post was written by Dennis Bryan Bait-it for Green Peace.